Aaron Blumenthal represents whistleblowers and consumers in class action lawsuits, with a special emphasis on data breach and privacy litigation. For example, Aaron represents victims of the Anthem data breach, which impacted the personal information of approximately 80 million people. Aaron attended law school at the University of California at Berkeley, where he graduated Order of the Coif, the highest level of distinction. 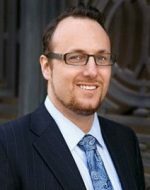 In law school, while working on consumer issues, Aaron wrote and published an article in the California Law Review recommending practical strategies for combating anti-consumer class action waivers. Prior to law school, Aaron coached Public Forum debate, and was one of the winningest debate coaches in the nation. Girard Gibbs is a national law firm committed to protecting the rights of our clients who have been harmed by corporate misconduct. We represent individuals, whistleblowers, institutional clients and small businesses across the U.S. against the world’s largest corporations. Our attorneys have achieved landmark recoveries in high-stakes cases involving securities and pharmaceutical fraud, false advertising, privacy, personal injuries, and employment law violations.